During one weekend, we drove by this restaurant and we see that quite a lot of people in there, so we decided to stop by the restaurant and give it a try. 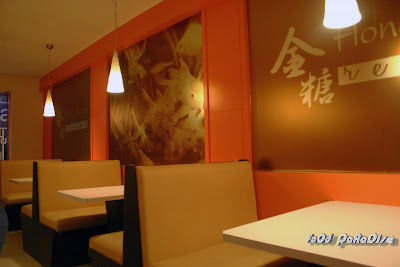 The Restaurant is located at Taman Hijau Tiga, Batu Lanchang. The restaurant is air-condition and few tables are located outside the restaurant. We were very lucky as we manage to get a seat inside the restaurant. The moment we sat down, we were attended and we start to order our dishes for the night. After we placed our ordered, the restaurant are full house and some customers have no choice but to sit outside the restaurant. The soup is normal home cooked soup but it tastes very delicious. My gal loves it very much. I think she is the one who finished most of it. 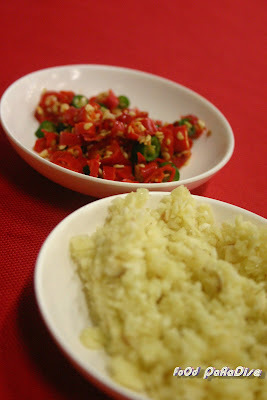 This is another great dish even though is a simple dish. Overall, their foods tastes very delicious. We will definitely go back again, price vice is also reasonable. However, a piece of advice ~ please go there early otherwise you will have to either wait or sitting at the outside of the restaurant which is open air. Before on our trip to Kudat, we picked up my brother from the airport and head to Tuaran for his breakfast. Since we already had our breakfast in the hotel, so we are not intend to take any. But after arriving at Tuaran, we went around the town area and spotted this shop which is full of customers. So we decided to give it a try. Located at Tuaran. Tuaran is 33km away from Kota Kinabalu, Sabah. It is just a little small town. 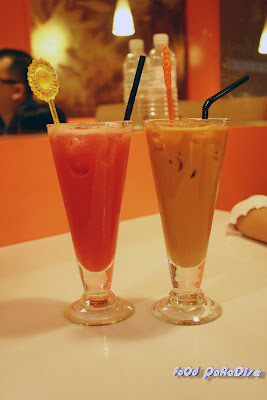 While we were seated, all the "Tham Chiak" person in our table are looking around other tables. After the waiter came to take our orders, all of us "Pause" for a minute as we don't know what they offer. Basically we saw most of the tables order noodles. Wet, dry, fry version. When this being serves...... err..... looks like "instant noodles" with some eggs and garnishing with some"Char Siew" and "Fish Cake Slice". How's the tastes? I am too eager to find out after I finished taking the photo. My brother say...... errr.... why don't you try some? Oh "O"......tastes really bad is it? He just laugh. So. I go ahead and try...... hmmm..... the noodles got the QQ textures. Tastes vice is not bad. After my brother order, I decide to order Kolok Tuaran Mee as next to our table is having that. lol I cannot order more as others say they are really "FULL". Location: Block C, Lot 8, Ground Floor, Segama Complex. Kota Kinabalu, Sabah. My sis opts for this and she loves it very much. This is my order and I am very disappointed with this. Want to know the reason? The grill salmon tastes very nice. And it is served with chips, garlic bread an coleslaw. Next..... the grill chicken. The chicken is very tender and juicy. And the marinated sauce has a very nice aroma. It is also served with chips, garlic bread and coleslaw. I order Tiramisu to try and the tiramisu cake has a very strong taste of liquor. And the sponge cake is finely done. Overall, the cake tastes nice and every one loves it. Location: G823, Ground Floor, 1 Borneo, Jalan Sulaiman, 88450. Kota Kinabalu, Sabah, Malaysia. According to hubby, the burger tastes not bad. 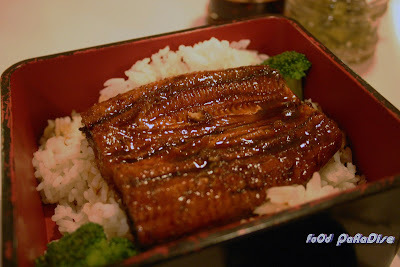 The unagi is grilled and it is only top with the normal soya sauce. :D The tastes is like, you pour some soya sauce directly on top of the unagi. So what do you think it will taste like? It tastes odd. 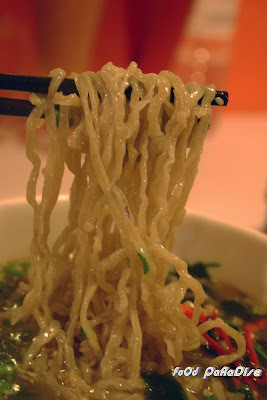 The ramen also has the QQ textures. And the soup base is very sweet and delicious. 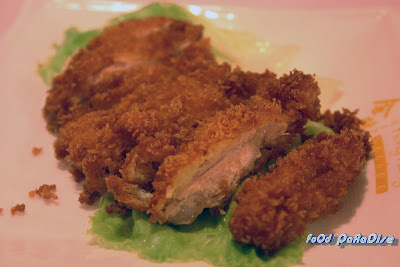 The chicken chop tastes nice and the chicken is very tender and crispy. 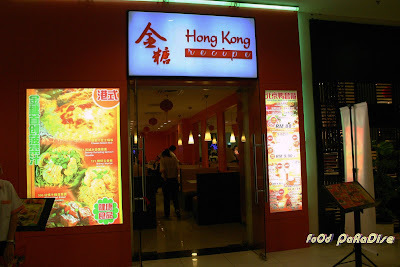 Overall..... the foods are just average as compare to Xin Wang Hong Kong Cafe. Location: Off Jalan Mat Salleh, Tanjung Aru. The restaurant has two sections - air condition and non air condition. The photo above is the non air condition section. My sister kept reminding me that the chillies sauce is very spicy around in Sabah, and she asked me to try a small amount first before scooping lots of it. 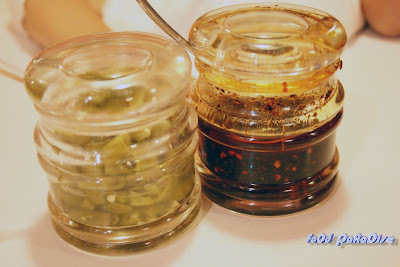 I let my mum to be the honour to try it first as she always comments that the chillies in Penang are not spicy at all. lol After mum tried some and she told me that it is really spicy. I did try it and it is really hot and spicy, the burning sensation that really makes you awake. Hubby so happy that the first dinner at KK, he is able to try this white blotched snapper. He's been wanting to try this fish when he saw Ah Xian programme. 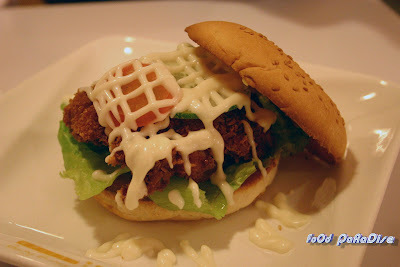 lol As Ah Xian said the textures of the fish is exactly like chicken. And this proves that to be true. I think hubby is the one who finished most of the fish. lol The fish is very fresh. When the clam arrived, we look at the shell, it's look like scallop. However, it is a clam. And the clam tastes very nice. If you been to some part of Sarawak or Sabah, you might have the chance to savour this type of vegetables. Let me introduce to you what is Sayur Manis? 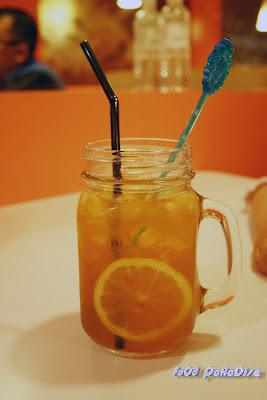 Actually it is something like "Mani Chai", Babi Chai"......, Different places tend to call different names. 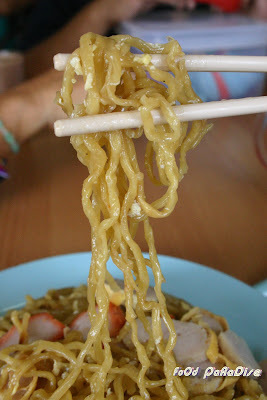 It is usually serves in pan mee. The leafy vegetables that serve in the Pan Mee is what I refer to. However, we consume all the stems for the sayur manis. For the "Mani Chai" or........ we usually consume the leaves only. 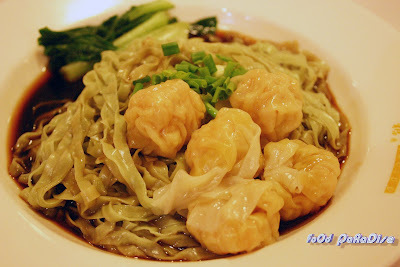 You can see the photos of sayur manis from http://www.borneo-hotels.com/info/dining.htm. "This leafy vegetable was first discovered in the Sabah town of Lahad Datu by a farmer, who found a way to grow the stems into a crunchy texture and give the leaves a tender texture. Today, Lahad Datu is famous for these leafy greens." 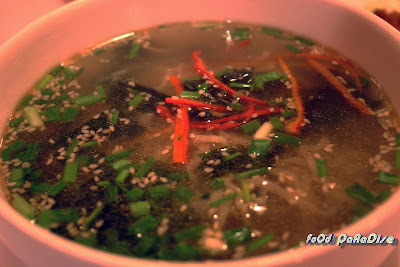 This is one of the vegetables that I will order whenever I visited KK. lol It is very crunchy. My hubby loves it after he tried it. The mantis prawn is very fresh and the textures of the mantis prawn are just right. It is well cook with the nice aroma. Very yummy indeed!